Too Much Coffee - come and get it! You’ve reached your sixth espresso of the morning and are feeling pretty wired. What you need is to burn off a little energy. 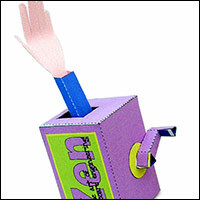 What better way than by vigourously cranking the handle of this delightful cardboard creation. 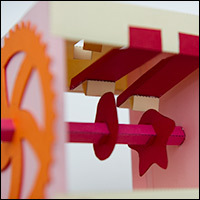 Check out the YouTube video of the model in action here. 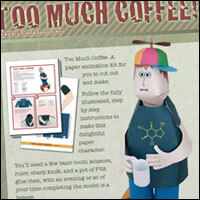 Too Much Coffee is an paper animation kit for you to download and print out on your own computer. 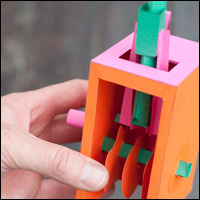 You’ll need some thin card (about 230 micron is fine), some scissors and some white school glue. A cutting board and asharp knife will also come in handy. 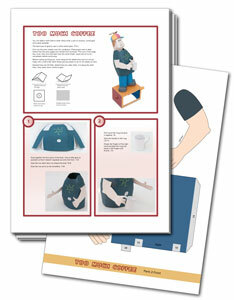 Too Much Coffee is supplied as two files, a full set of illustrated, step by step instructions and a separate file containing all the parts that you will need printed front and back on six sheets of card. 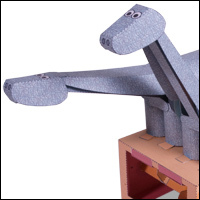 So settle down with another cup of coffee and download, print out and make this delightful model.